Migraines are a neurological sickness characterized by attacks of headaches of strong or moderate intensity, as well as other neurological symptoms. They have a prevalence of 15% in the general population and considerably impact patients’ quality of life. Foods trigger migraine attacks in about 10% of cases. The major cause in this respect is chocolate, followed by cheeses and lactose products, acidic fruits, alcoholic beverages, fried greasy foods, pork products and seafood. The provoking factor could be amines or vaso?active products, but the existence of an authentic food intolerance in certain migraines has also been postulated. In the case of a specific food intolerance triggering migraine attacks, a clear scientific interest arises to improve knowledge of the physiopathology of migraines, such as in clinical aid, which translates into prescribing migraine patients only that which truly causes problems in their diet, and so finding an equilibrium between a suffocating excess of prohibition and an unimportant disinterest via the food factor. The hypotheses of this work began by considering that patients with migraines have an intolerance to certain foods, determined by the ALCAT test. Furthermore, the foods the ALCAT tested as positive aggravate migraines. Therefore, a diet that avoids these foods would improve migraines, in the number of monthly attacks, intensity of pain and duration of the attacks. 1? May lead to more precise studies with control group and randomization. 2? Will offer a better comprehension of the physiopathology of migraines. 3? Serves as a base to consider a specific diet as preventative treatment against migraines. 5? A specific diet could improve migraines, saving pharmacologic treatments. Migraines can be a manifestation of food allergies or intolerance. The Alcat Test reveals intolerance to 100 common foods, included in addition to such common foods in the diet, some coloring agents and preservatives used in food. To detect possible allergies, the test with allergens at the office of a specialist is appropriate. A study performed by the Immunological Center of Catalunya demonstrates that 90% of patients suffering migraines reasonably improve thanks to the elimination of some foods in their diet. Migraines improve thanks to the elimination of some habitually eaten foods from our diet. Always clear is that migraines have an origin in food. In some patients with chronic migraine attacks that do not adequately respond to conventional treatments, we should consider the possibility that the triggering cause could be an intolerance to a food or group of foods. The Alcat Test is a test of American origin that studies the reaction of our bodies against the 100 most common foods of the Mediterranean diet. With a simple blood extraction we can determine, after 15 days, what foods we tolerate well, regularly, or poorly. In the case of migraines, we can detect what foods provoke them. From the results of the Alcat Test we can create a personalized dietetic profile, which permits us to mitigate the migraines produced as a consequence of the intolerance detected by the tested components. Patients eliminate those foods that provoke migraines from their diet for a reasonable period of time, which we determine to be between 6?12 months. Others undoubtedly should eliminate those foods for life if the test continues to indicate a high intolerance, especially if we detect that each time we introduce these foods into the diet, migraines occur.
? Determine if a food intolerance exists in migraine patients.
? Determine if dietetic abstention from those foods from which migraine patients suffer intolerance improves their migraines (frequency or quality of attacks). This was an open pilot study of migraine patients under a specific diet, run by the Cefalea Study Unit and the Immunologic Center of Catalunya. This is an observational study with prospective follow?up. 3 different phases were used based on the diet followed by migraine patients. The patients who met the inclusion criteria were included and we determined the existence of their intolerance to food via the Alcat Test. The patient begins by filling out the notebook recording the data of their migraines in this phase. The patient included in this study with positivity ++ or +++ to specific foods/additives in the test continues with a dietetic treatment for 3 months and records the frequency and characteristics of migraine attacks. The patient continues on his or her prior normal diet for 3 months and continues recording the frequency and characteristics of migraine attacks. The patients were followed for 7 months. They recorded data in a notebook (CRD) developed for this end, in which they recorded the original results next to the Alcat Test insert from the Immunologic Center of Catalunya.
? Men and women older than 18 years.
? Patients that met the defined criteria for IHS for migraines without aura and migraines with aura.
? Patients with stable migraine medication for the 3 months prior to inclusion.
? Patients with positive results (++ or +++) to the Alcat Test for at least one evaluated food or additive.
? Patients that had given informed written consent to participate in the study.
? Patients capable of understanding and responding to the questionnaires.
? Patients diagnosed with other primary cefaleas (stress migraines, cluster headache).
? Patients with secondary migraines or suspected of secondary migraines.
? Beginning or modification of anti?migraine preventative treatment during the 7 month course of study.
? Patients that present exclusive positive (+) results on the Alcat Test.
? Patients with food disorders. The variables in this study are comprised of socio?demographic variables of the patient, clinical variables related to migraines and diary of the patient with the number of migraine attacks in 3 distinct periods: the inclusion phase, phase I and phase II. 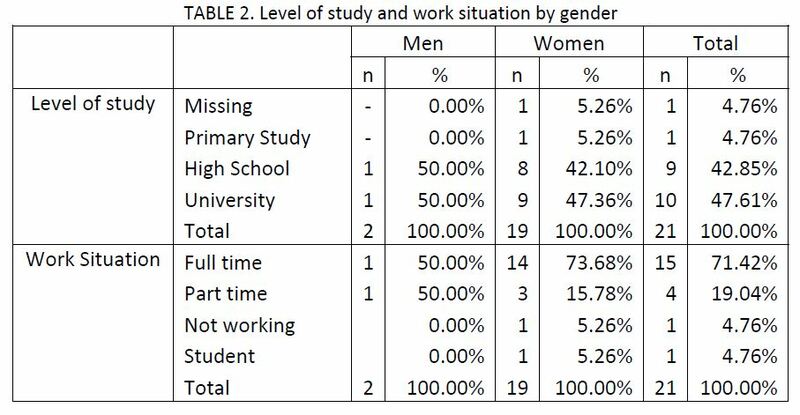 The socio?demographic variables chosen in this study were date of birth, gender, level of studies completed (university, high school, primary school or no studies) and work situation (actively working, not working, retired, remote or incapacitated, housewife, student, among others). The clinical variables are related to habits of the patient, treatments or consumed medicines, and characteristics of the migraine itself. consumption of tobacco, alcohol or other toxic substances. ?Age of first migraine, type (with or without aura), average frequency during the past year, intensity and average duration of the attack. Furthermore, the patients describe their own characteristics, type of establishment, circadian rhythm, circanual rhythm and the symptomology (warning signs).
? Location of migraines, incidental factors and precipitating factors.
? Accompanying manifestations, neurological manifestations and duration and frequency of the specific symptoms of each attack.
? Migraine treatments received in the 3 previous months, use of analgesics and answer of the patient to the actual prophylaxis received.
? Physical exploration: blood pressure, background of eyes and signs of stress. Regarding the clinical data, upon the moment of inclusion of patients in the study, they recorded migraine attacks suffered in the first and second phases of the study. In these attacks, they recorded the beginning and end of the attack, the level of pain of the attack and the symptoms associated with the migraine (nausea, photophobia, vomiting, phonophobia, menstruation). The main variable of this study corresponds to the frequency of migraine attacks, measured as the number of attacks per month in Phase I and Phase II. As secondary variables, we considered the intensity of pain, duration of the migraine attack and other associated symptoms. Patients would not be willing to take additional risks by participating in the study, since their inclusion does not bring about a practical, evaluative or therapeutic diagnosis beyond that which their doctor would give for migraine treatment, with the exception of determining food intolerance via the Alcat Test. Before patients were included in the study, they were informed of the objectives and methodology of the study via informational flyers given to them. The patients were informed of their right to quit the study at any time, without which the doctor?patient relationship would be harmed. The identity information of the patients has been considered totally confidential. The identity of the patients has not been revealed or divulged. The acts of the patients recorded in the CRDs during the study have been documented anonymously and disassociated, linked to a code (patient number), in a manner that only the researcher can associate data to an identified or identifiable person. In references to the data of the study, we have followed the law established in the Ley Organica 15/1999 of December 13, “Protection of Data regarding Personal Characteristics”. The base of the data that this study has generated does not contain any identification of the patient beyond a numerical code, through which it is not possible to discover their identity. Said identity will always remain under the doctor?patient relationship. In the data collection forms, the subjects have been identified by a patient number. Prior to the beginning of the data analysis, the base data was validated to ensure data quality. When deemed necessary for a correct interpretation of the results, the tables summarizing constant variables presented in this study have been explained by the average, standard deviation, minimum, maximum, median and number of valid observations. The categorical variables have been summarized using the count of cases in each category and the total relative frequency of answers. The data has been analyzed utilizing SAS statistical packet version 8.02 for Windows. In all statistical tests the level considered of significance was, ?=0,05, as indicated in the protocol. We have analyzed the distribution of each of the variables to define possible recodifications, as much in categorical variables as in constant variables. When necessary, the recodification has been done on the basis of 3 variables: defining categories with clinical significance, reducing the maximum number of categories and obtaining the maximum homogeneity in the number of cases in each category. We have performed a descriptive analysis of the socio?demographic and clinical characteristics of the patients of the study according to gender. 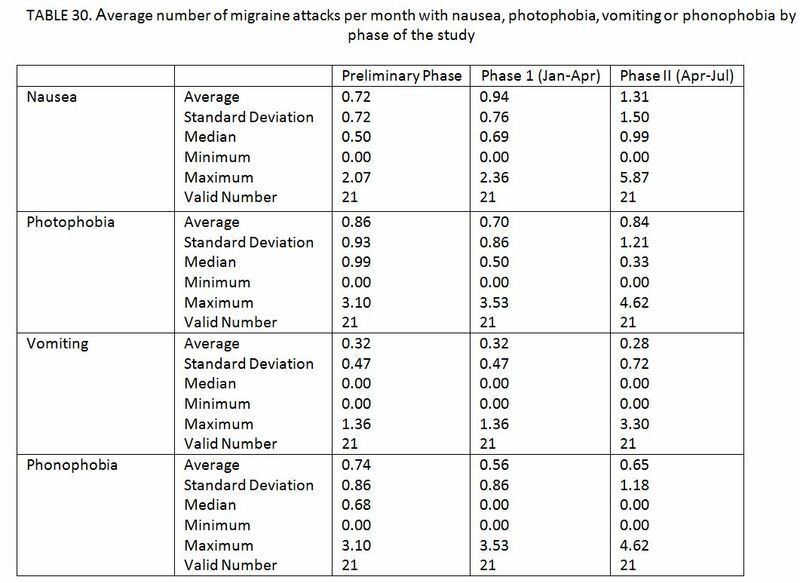 Comparison of number of migraines per phase of study. After the base description of the sample, we have analyzed the number of attacks of the patients upon having received a specific diet (Phase I) and after having abandoned the diet (Phase II). We have compared the average number of attacks per month measured by a T?Test for measures grouped taking a significant level of ?=0,05. 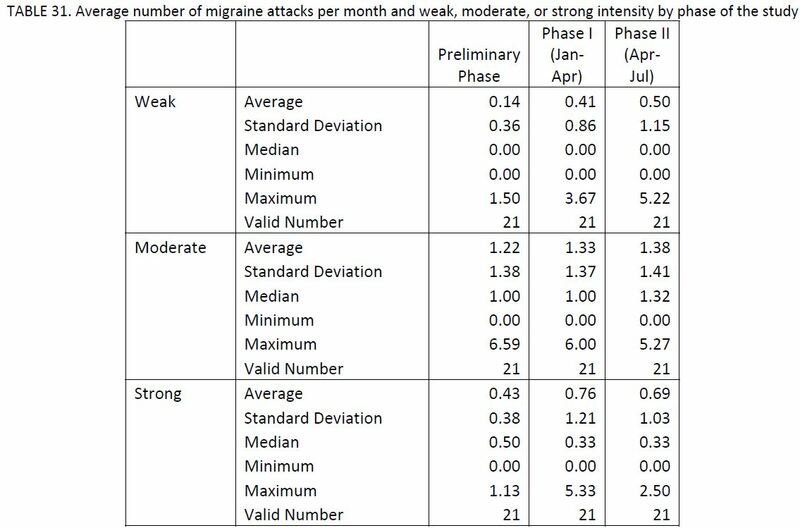 The number of attacks per month has been calculated as the total number of migraine attacks reported by the patient in each phase over the total months, not specifically reported in the final data base but included as a variable for purposes of the external information. In addition to the analysis of the total number of attacks, we also analyzed the number of attacks that presented nausea, photophobia, vomiting and phonophobia separately. On the other hand, we also have compared the number of attacks with weak, moderate or strong pain per phase of the study. 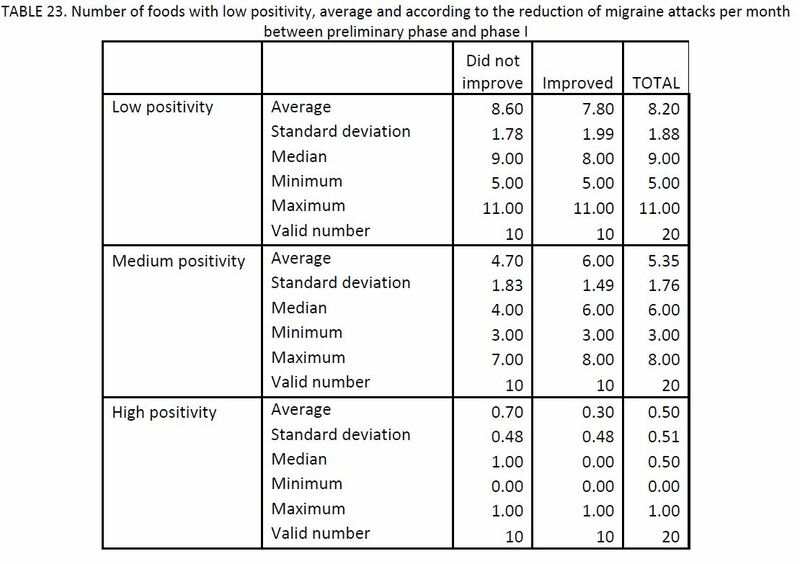 Finally, we have made a comparative analysis of the number of food and/or additives that presented a low (Range 1+), middle (Range 2+) or high (Range MPOS) positivity on the ALCAT test between the patients that improved the number of monthly migraines between the inclusion phase and phase II and those which did not reduce in the number of migraine attacks. The following presents a description of the socio?demographic and clinical characteristics with respect to the cormorbidity and symptomology associated with the patients’ migraine attacks. All the results have been stratified by gender, although the lower sample size and the gender distribution obtained does not permit a comparison between groups. The sample of 21 migraine patients was composed of 2 men and 19 women. The average age (DE) was 39 (10.8) years (table not shown). 42.9% were within the age range between 30 and 39 years, although 33.3% of the patients were also between 40 and 49 (TABLE 1). The most frequent level of schooling was high school or university study (90.5%) and the majority of patients worked actively on a daily basis. personal and family records, the factors associated with migraines and the treatments received. The average blood pressure (TA) was 117/69 mmHg, observing normal values in all cases, just as in the sample in TABLE 3. Upon finding a background target, we did not observe any change or abnormality in the physical examination. the patients included in the study showed pain in pressure on the Arnold point. nettle rash. HTA was present in 2 of the 21 cases (9.5%). Regarding tobacco habits, only 14.3% of the patients included in the study presented records of tobacco use (past or present), while 23.8% present toxic records related to alcohol, although not at very high levels. As shown in TABLE 7, the age of the first migraine was around 10 or 15 years old in 47.6% of cases, followed by 28.6% beginning between 15 and 20 years of age. The most frequent type of migraine is without aura (80.9%) with an average weekly frequency during the previous year in 52.4% of cases. In this case, we distinguish that the 2 men of the study present a monthly frequency. 81% of the patients describe their attacks with an average of moderate or strong intensity and a more varied duration, but not surpassing 72 hours in any case. The following table demonstrates the location of migraine attacks, with the hemi?cranial zone being the most frequent and the front?orbital being less frequent. In general, they correspond to alternate attacks, without location on either side. 90.5% of attacks begin in a deceptive manner, with a benign appearance but evolving to increased gravity, and they come to be pulses (only one case presented oppressive migraines). They did not show a pattern of daily nor annual cyclical establishment, being the variable circadian and circanual rhythm. Paralleled, 66.7% of the patients asserted having no preliminary symptoms associated with migraine attacks, although 28.6% presented irritability as a precursor symptom to migraines. Regarding factors that can be traced to the incidence of migraines, we observe that according to 90.5% of patients, physical activity worsens attacks, the supine position improves it (52.4%) and the orthostatism doesn’t affect the incidence in 71.4% of patients. Other incidental factors such as sleep, improve migraines (81%) and on the contrary, valsalva increases the incidence of attacks (76.2%). 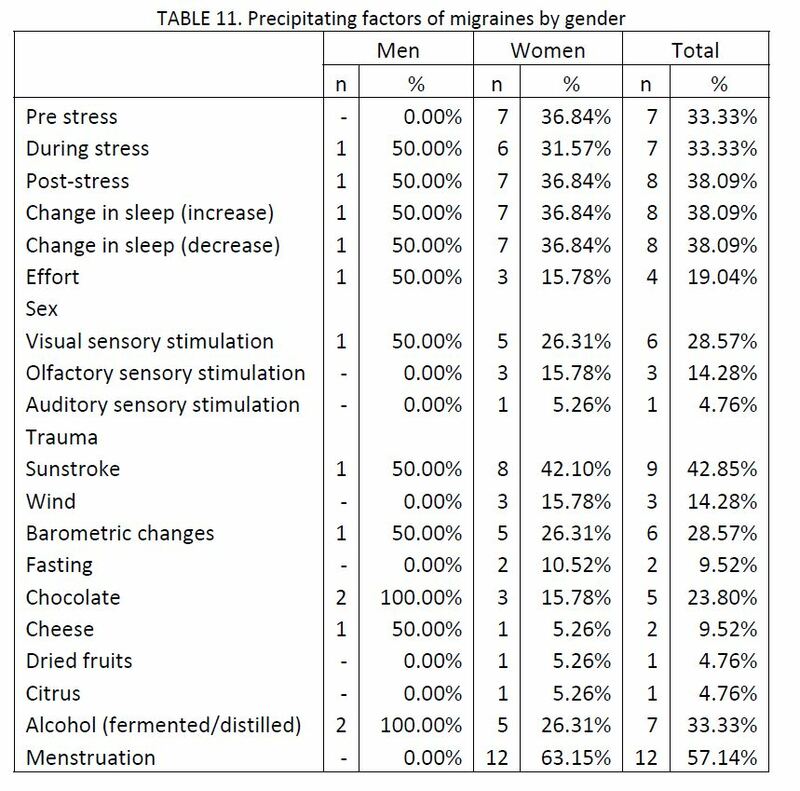 As precipitating factors of migraines, outstanding were menstruation in women (63.2%) having been in a period of stress, lack or excess of sleep (all with 33.3% of cases), followed by excessive sun exposure (42.9%) and prior situations of or during periods of stress, and alcohol (33.3%). 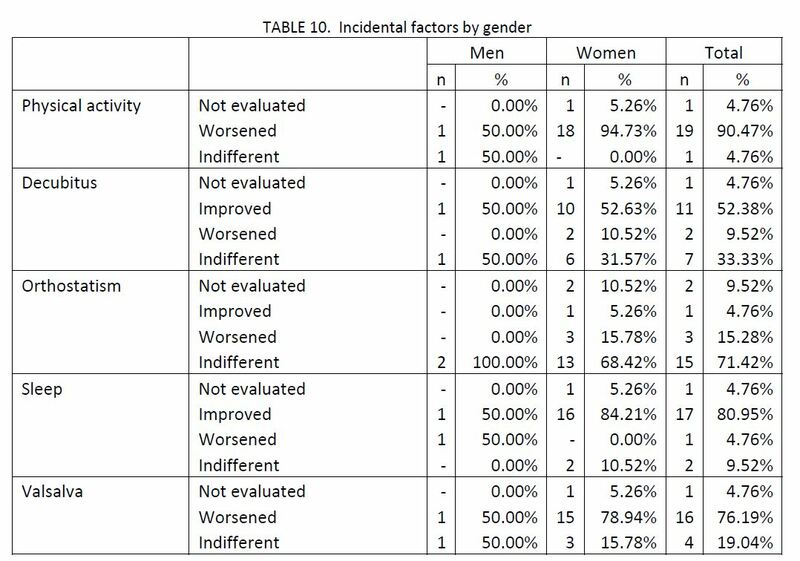 The list of precipitating factors by gender is shown in TABLE 11. 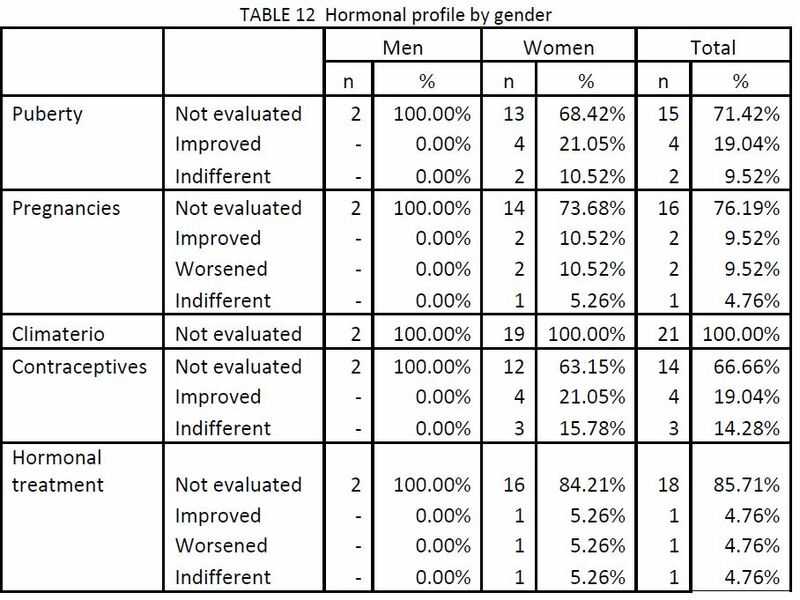 The analysis of the relationship between hormonal changes and the worsening or improvement of migraines cannot be evaluated with precision given the low number of answers obtained, observing a large variation in the answers. 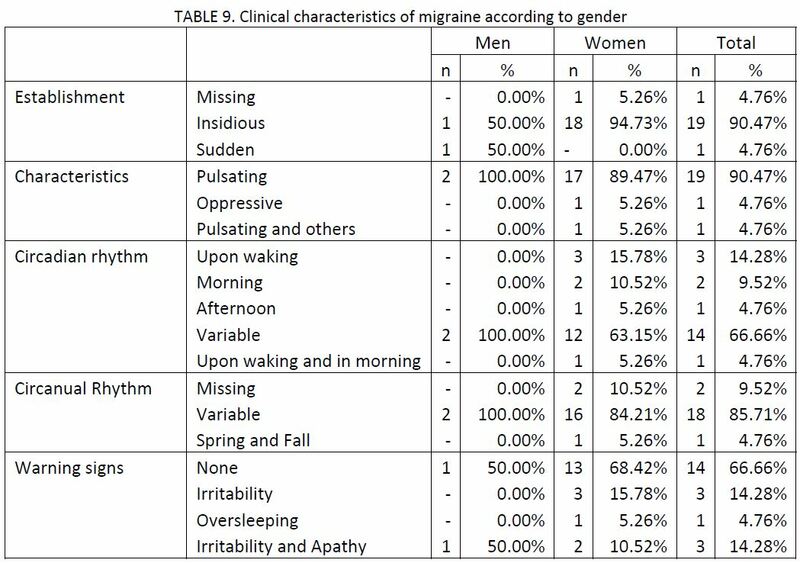 The following table shows the incidence of each of the manifestations that customarily accompany migraines, in alphabetical order. Emphasis, with a frequency of appearance above 80%, is given to the presence of nausea and sonophobia (90.5%), photophobia (85.7%) and with a lower frequency, vomiting (52.4%), which also accompany these attacks. Prior to the beginning of migraine attacks, distinct accompanying symptoms appear with a very low frequency; precisely in the beginning, symptoms begin to appear such as photophobia, nausea and sonophobia (28.6% of cases). During the attack, the symptoms are at the highest level and sonophobia affects 90.5% of patients, photophobia 81% and nausea 76.2%. 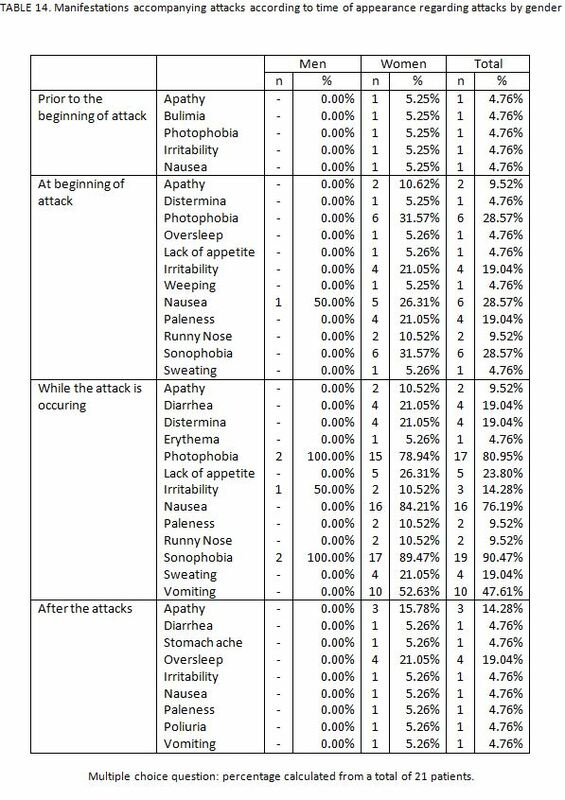 Finally, the most frequent post?attack symptoms are oversleep (19%) and apathy (14.3%). 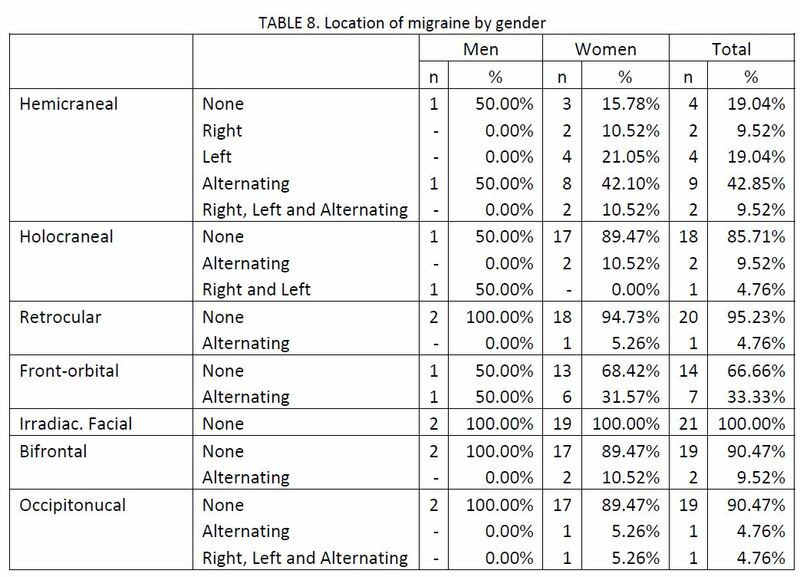 The following table shows the presence of neurological manifestations by patient, emphasizing a total of 10 of the 21 patients (47.6%) with migraines, generally alternating. Other neurological symptoms that appear during attacks are related with affectations of the visual field, such as blind spots (4.8%), flashing blind spots (19%) and hemianopsia (14.3%), representing a low frequency of appearance. 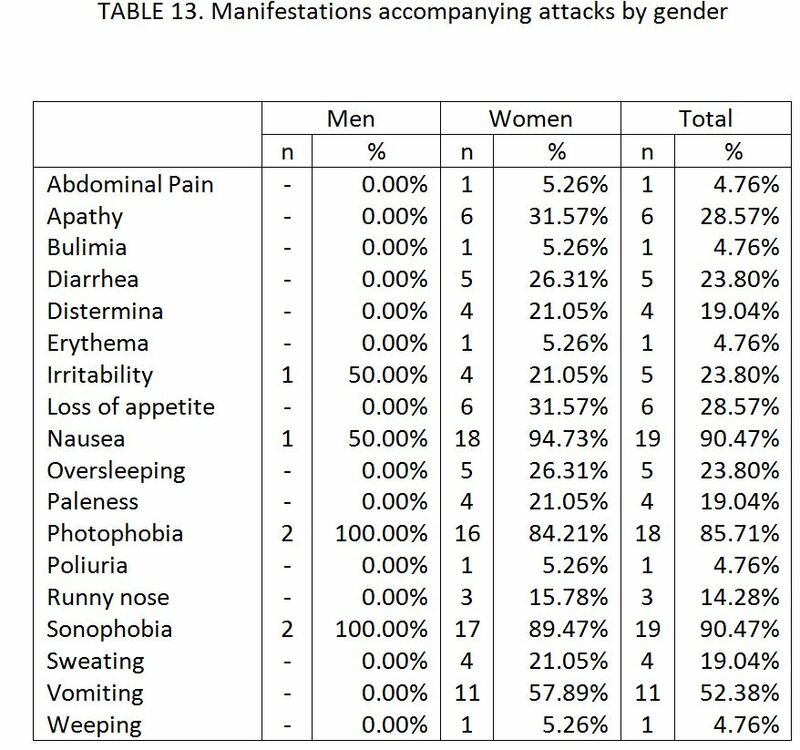 In spite of presenting a very low frequency of neurological manifestations, the following table shows the approximate duration of these manifestations as related to migraine attacks (although never greater than 1 hour) as well as establishment of these symptoms, appearing in all cases in a progressive form. Other types of migraine are stress migraines or migraine headaches. Only one patient (male) presented stress headaches. There was no other case of such migraines (table not shown). 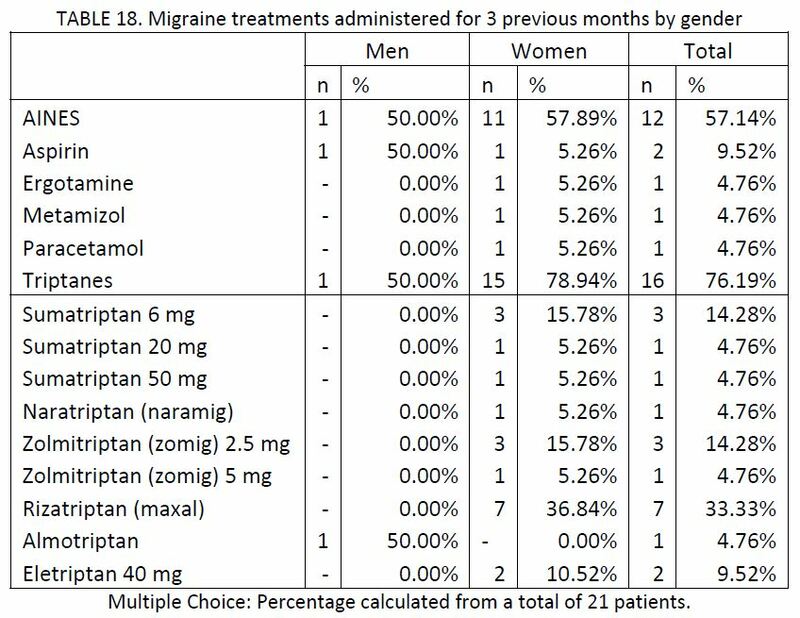 The most normal anti?migraine treatments administered in the 3 months prior to inclusion (TABLE 18) were triptanes (76.2%) and AINES (57.1%), followed by acetyl salicylic acid acid (9.5%). Among them, the most frequent pharmaceuticals were Rizatriptan (33.3%), Zolmitriptan 2.5 mg and Sumatriptan 6mg (14.3% each). No patient was receiving anovulatory treatments; undoubtedly, the habitual use of analgesics was totally established with a weekly frequency in all cases (tables not shown). The treatments most frequently used as prophylaxis (TABLE 19) were B?Blockers (5 cases). Among the other treatments used as prophylaxis with good response were ISRS, amitrypthaline, seroxat and tryptizol. As we have commented in the description of the design of the study, the first phase corresponds to the evaluation of the number of migraine attacks that patients had following a dietetic guideline to control the food factors that favor the appearance of migraines. The second phase, contrarily, corresponds to the evaluation of the number of attacks after having returned those same patients to their normal diet without restrictions. Overall, a total of 176 and 174 attacks have been recorded in Phase I and Phase II, respectively. In the inclusion phase (preliminary phase) we see 141 migraines, of which only 84 have been dutifully documented. In the first place, we have described the number of months (following or not following the diet) in the two periods, as well as the number of countable attacks. In the preliminary phase of the study, the patients had presented an average of 6.7 (4.6) migraine attacks in a period of 2 months. The average (DE) time of Phase I was 3.2 (0.4) months and that of Phase II was 3.2 (0.6) months. In the same respect, in the first phase there was an average (DE) of 8.4 (5.5) attacks as opposed to 8.3 (4.6) attacks in the second phase. The number of attacks by phases varies by a minimum of 2 to a maximum of 21 migraines. 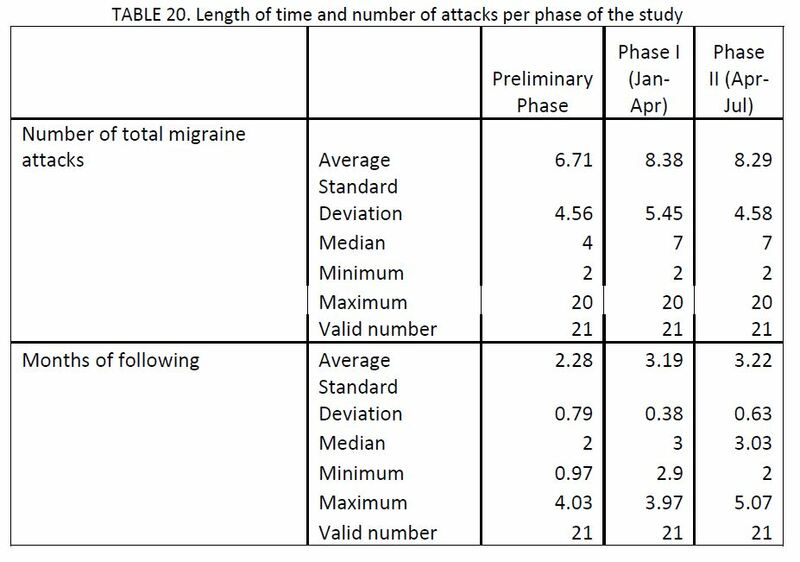 In the analysis of the average number of migraines per month, we have observed a similar number of attacks in both phases: in the first phase the average (DE) was 2.6 (1.7) attacks, as opposed to 2.7 (1.6) migraines in the second phase of the study. These differences have not been statistically significant (p=0.937). Nor have we found differences in the number of monthly attacks between the inclusion phase (2.9 attacks per month) and the period in which we established a diet (p=.347). 47.6% of the patients reduced the number of migraine attacks per month in Phase I compared to the inclusion phase, while 52.3% did not reduce the number of attacks per month. 9.5% of patients that did not see any change are included in this percentage (TABLE 22). Continuing, the following table (TABLE 23) shows the number of foods with low, medium and high positivity, stratified by the reduction of migraine attacks per month between the inclusion phase (or phase 0) and phase I. In the first place, the average number with low positivity was 8.6 and 7.8, in patients that did not improve and improved the number of attacks per month, respectively, without being statistically significantly different (p=0.3170). On the other hand, the number of foods with medium positivity was lower, being 4.7 in patients that did not reduce the number of attacks and 6 foods by patients between those that improved the frequency of attacks, without observing differences between groups (p=0.154). Finally, we have not found any statistically significant relationship between the presence of foods with high positivity and the improvement of the number of attacks, although it leads to significance (p=0.074), in a way that, if the sample size were increased, a larger percentage of patients presenting high positivity to some foods would improve in number of migraines. TABLE 24 shows the percentage of patients that presented high positivity to some foods and/or additives on the Alcat Test. 63.6% of patients did not reduce the number of attacks per month, upon the establishment of the diet presented high positivity to some food, while this percentage reduces to 30% in patients that reduced the number of attacks (p=0.074). 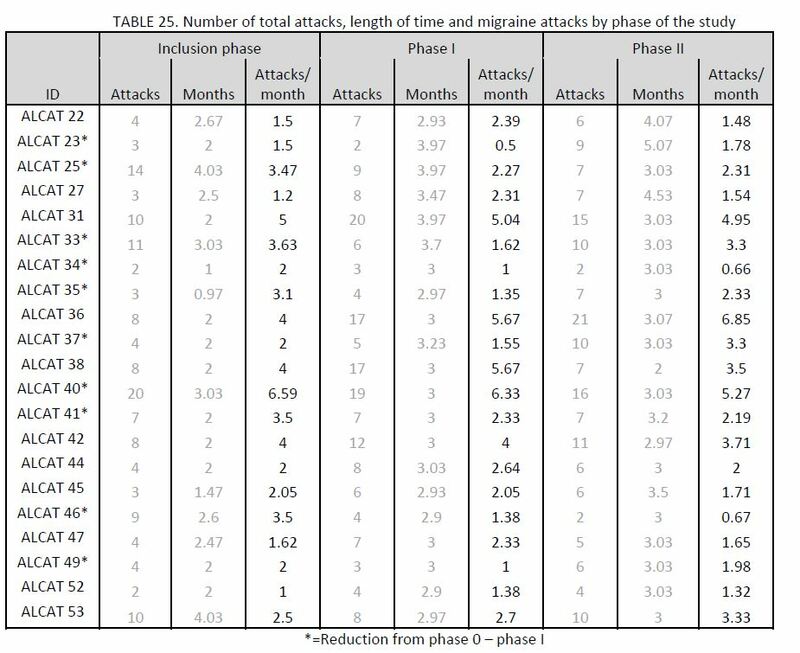 The following shows the information related to attacks observed by patients phase of study, along with the time period of each phase (months) and the average number of migraine attacks per month. Similarly, the average duration (DE) of attacks in the preliminary inclusion phase of patients in the study was 18.9 (14.9) hours, in phase I 19.5 (17.8) hours and in the last phase, 21.9 (30.1) hours on average. We have not observed differences in the average duration of attacks between phases: neither in the inclusion phase?phase I (p=0.487) nor between phase I?phase II (P=0.542). As observed in the following table, the duration of the attacks varies from one hour to almost 7 hours of average duration. In a descriptive fashion, the following table shows the distribution of the average duration of attacks by patient, categorized according to the average time of the evaluated period. We observe that in 57.1% of the patients, the average duration of attacks surpassed 12 hours in the inclusion phase, while in phase I, corresponding to diet restrictions, the percentage of patients with attacks of more than 12 hours was reduced to 47.6%, and in phase II, without restrictions, the percentage was 52.4%. Of the total of recorded attacks at the end of the study (n=434), the average duration (DE) was 16.3 (23.5) hours, in a range that varies from few minutes to 10 days of symptoms. 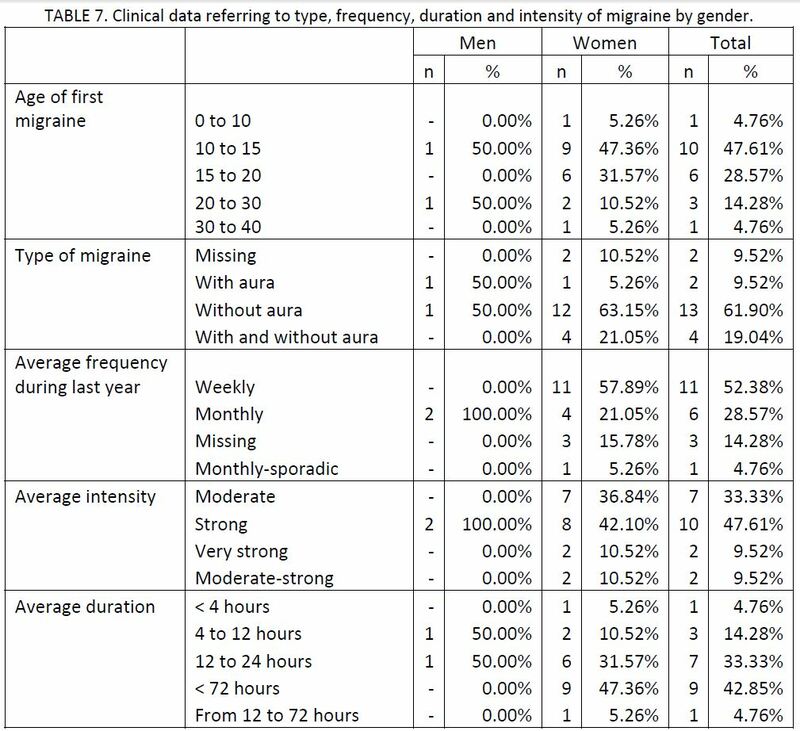 The following table and Figure 2 show the distribution of the duration of the migraines appearing during the study. Regarding the total recorded attacks, in the inclusion phase, 41.7% lasted more than 12 hours on average, while in phase I this percentage was reduced to 35.8% and in phase II to 36.2%. On the other hand, the following table describes the appearance of the proprietary symptoms of migraines (nausea, vomiting, photophobia and sonophobia) stratified by phase of the study. Nausea appeared with greater frequency in phase II (35% vs. 50%). On the other hand, in the case of photophobia, the frequency of appearance of the symptom passes from 41.7% in the inclusion phase to 28.4% in phase I. Similar results occur with phonophobia, the frequency of appearance having been 35.7% in the inclusion phase and 23.3% in phase I. The analyses of these data have been performed independently from each other (not together). Upon analyzing the number of attacks that presented nausea as an accompanying symptom, during the diet period a total of 0.9 (0.8) attacks were recorded per month, as opposed to 1.3 (1.2) attacks in the unrestricted diet period, nevertheless, these differences have not been statistically significant (p=0.203). Nor have we found differences in the number of attacks per month that presented photophobia (p=0.368), vomiting (p=0.756) or phonophobia (p=0.496). These results are presented in TABLE 30. Regarding the analysis of the first two phases, we have not observed differences in the number of attacks per month with nausea between the preliminary phase and the period with a diet (p=0.235). Nor have we observed statistically significant differences between the inclusion phase and phase I in the number of monthly attacks with photophobia (p=0.423), vomiting (p=0.115) or phonophobia (p=0.414). Paralleled, given the importance of the intensity of pain of migraines, we have selected the migraine episodes according to intensity of pain; in other words, weak, moderate or strong pain (TABLE 31). We have not observed differences in the number of weak attacks per month of the study (p=0.398), nor in the number of moderate (p=0.701) or strong (p=0.709) attacks between phases. Nor have we observed differences in the number of weak, moderate or strong migraines between the inclusion phase and the diet period (p=0.128, p=0.612 and p=0.212, respectively). A total of 21 patients with migraines and with positive results on the Alcat Test for at least one evaluated food have been included with the objective of comparing the number of migraines reported during a period of diet of 3 months (phase I) and another period of 3 months without any dietary restriction (phase II). The sample was composed of 2 men and 19 women. The average (DE) age was 39 (10.8) years of age, with 42.9% of the patients between 30 and 39. The most frequent schooling level corresponds to high school or university studies (90.5%) and almost all of the sample was employed. The average blood pressure (TA) was 117/69 mmHg. There were some signs of tension: 28.6% showed an eyelid flutter,19% lingual indentation and 14.3% pain swallowing. 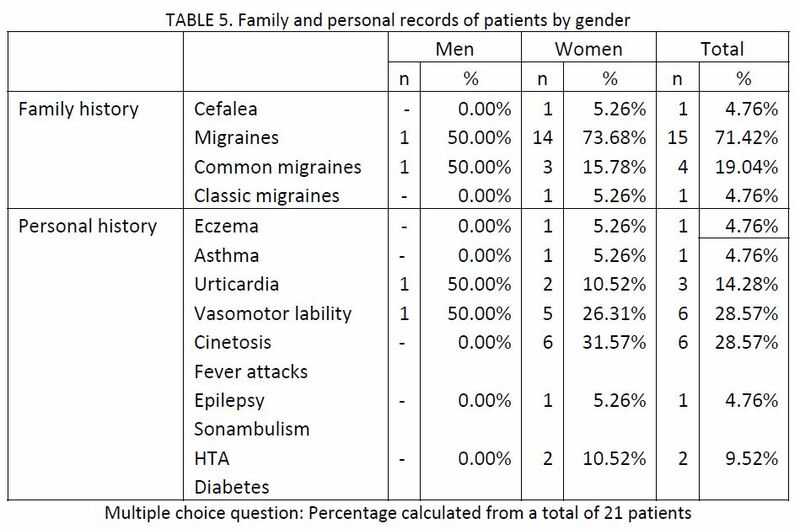 71.4% of the patients presented family history of migraines. The most frequent personal history was vasomotor ability and cinetosis (both in 28.6% of cases) and urticaria (14.3%). Only 14.3% of patients present history of tobacco use, while 23.8% present history of toxins related to alcohol. The beginning age of migraines was around 10 to 15 years old in 47.6% of cases. The most frequent type of migraine was without aura (80.9%) with an average of weekly frequency during the previous year of 52.4% of cases. 81% of patients described their attacks with an average, moderate or strong intensity and a duration never exceeding 72 hours. 90.5% of the attacks were established in an insidious manner, beginning with benign appearance but evolving into a stronger gravity, customarily pulsating and without presenting a pattern of cyclical establishment, neither daily nor annual. 66.7% of patients did not present warning signs associated with migraine attacks, although 28.6% present irritability as a precursory symptom of migraines. As far as the factors that can be related to the intensity of migraines, we observe that according to 90.5% of patients, physical activity worsens the attack, staying in position improves it (52.4%) and orthostatism does not affect the incidence in 71.4% of patients. Other incidental factors such as sleep improve migraines (81%), and on the contrary, the Valsalva maneuver increases the incidence of attacks (76.2%). As precipitating factors of migraines, we emphasize menstruation in women (63.2%), stressful periods (33.3%), lack or excess of sleep (33.3%), followed by excessive exposure to solar rays (42.9%), previous or present situations of stress and alcohol (33.3%). The most frequent accompanying symptoms were nausea (80%), sonophobia (90.5%), photophobia (85.7%) and with lower frequency, vomiting (52.4%). Other present neurological manifestations were cefaleas (47.6%), generally alternating. Overall, we recorded a total of 176 and 174 attacks during the diet period (phase I) and the nondiet period (phase II), respectively. The average (DE) length of time of phase I was 3.2 (0.4) months and for phase II, it was 3.2 (0.6) months. In the first phase there was an average (DE) of 8.4 (5.5) attacks as opposed to 8.3 (4.6) attacks in the second phase. The average (DE) attacks per month was 2.6 (1.7) in the first phase as opposed to 2.7 (1.6) migraines in the second phase of the study, without significant statistical differences (p=0.937). Nor have differences been found between the two phases of the study in the number of attacks that presented as accompanying symptoms nausea, photophobia, vomiting or phonophobia. On the other hand, the (DE) of attacks per months in the inclusion phase prior to establishment of the diet was 2.9 (1.4), without presenting statistically significant differences with the following phase. 47.6% of the patients reduced the number of migraine attacks per month between the inclusion phase and phase I or with food restrictions. We observed no difference in the number of foods with positive results (Range 1+ and Range 2+) on the Alcat Test between patients that reduced the number of attacks and those that did not. Nevertheless, we observe a tendency of patients that reduce the number of attacks to present less high positivity to foods (p=0.074). Regarding the average duration of the attacks, 57.1% of patients suffered attacks lasting more than 12 hours during the inclusion phase, while this percentage was reduced to 47.6% during phase I (the diet restriction). In the phase without diet restrictions (phase II), the percentage ascended to 52.4%. We have not found differences between the two phases of the study in the number of attacks that presented accompanying symptoms of nausea, photophobia, vomiting or phonophobia. In spite of the frequency of appearance of photophobia and phonophobia between the inclusion phase and phase I, we saw a reduction of 41.7% to 28.4% in the first of these symptoms and 35.7% to 23.3% in the second. We observe no differences in the number of weak, moderate or strong attacks per month of the study between phases of the study. Upon extracting conclusions from the obtained results in the present study, we should have in mind a series of limitations of the study that can have an important influence on the results. • In the first place, it is fitting to emphasize an aspect related directly with the design of the study. The crossed design is ideal to evaluate the effect of one or more interventions including the minimum number of patients, given that the same patient can act as a control. In this type of design it is very important that the applied intervention in one period has no effect during the following period, so as not to mask the possible existing differences. In the present study, the fact that before beginning the first period the patient knew the foods to which he or she presents intolerance can influence the diet not only during the first period (period of application of the diet). Especially if we think that we are in front of a younger population with a higher level of study. • Also related to the crossed design, we should determine whether the period of three months is sufficient to evaluate the impact of applying or not applying the dietary restrictions in the incidence of migraine episodes. • Another limitation to emphasize is that we do not know the fulfillment level of the diet during the first period of the study and if the patients, in spite of whether they indicated otherwise, have followed the diet during the second period. One would expect that if patients had detected changes during the first period due to the diet, they would have followed the same diet during the second period. A question about diet fulfillment in both periods would have informed us of, although it would not correct, this possible slant. • A final limitation to emphasize, although not considered very important in the results, is the reduced sample size. In spite of arranging a very small sample of patients, the differences observed between periods are very small, not resulting in clinical relevance. In order for the differences detected between periods would have been statistically significant, we should have included a very large sample of patients. • Finally it is fitting to emphasize that in the protocol of the study, we commented on the possibility to evaluate the prevalence of food intolerance among the patients of this study. Nevertheless, given that in the study we only included those patients with food intolerance, we could not make such calculations. It would be convenient to compare the number of patients to those that had taken the Alcat Test.
? Almost half of the patients included (47.6%) reduced the number of migraine attacks per month between the inclusion phase in the study and the phase of dietary restriction.
? The percentage of patients that suffered attacks for more than 12 hours decreased from 57.1% in the inclusion phase to 47.6% in the dietary restriction phase.
? The frequency of appearance of accompanying symptoms such as photophobia and phonophobia between the inclusion phase and the dietary restriction phase was reduced from 41.7% to 28.4% in the first case and from 35.7% to 23.3% in the second. This pilot study serves as a base for future research in the field of food intolerance in patients afflicted with migraines. 1. Jansen SC, van Dusseldorp M, Bottema KC, Dubois AE. Intolerance to dietary biogenic amines: a review. Ann Allergy Asthma Immunol. 2003 Sep; 91(3): 233?40; quiz 241?2, 296. 2. Millichap JG, Yee MM. The diet factor in pediatric and adolescent migraine. Pediatr Neurol. 2003; 28(1):9?15. 4. Empl M, Straube A. The immune system and primary headache syndromes. Anaesthesist. 2001;50(10): 783?91. 5. Rankin LM, Bruhl M. Migraine in older patients: a case and management strategies. Geriatrics. 2000;55(7): 70?4. 6. Le Sellin J. Clinical signs of food allergy. Allerg Immunol (Paris). 1997; 29Spec No:11?4. 7. Fourrier E. Alergy to cow’s milk. Allerg Immunol (Paris). 1997; 29(4):108?10. 8. Leira R, Rodriguez R. Diet and migraine. Rev Neurol. 1996; 24(129):534?8. 9. Pradalier A, Launay JM. Immunological aspects ofmigraine. Biomed Pharmacother. 1996; 50(2):64?70. 11. Bentley D, Kehely A, al?Bayaty M, Michie CA. Abdominal migraine as a cause of vomiting in children: a clinician’s view. J Pediatr Gastroenterol Nutr. 1995; 21 Suppl 1: S49?51.